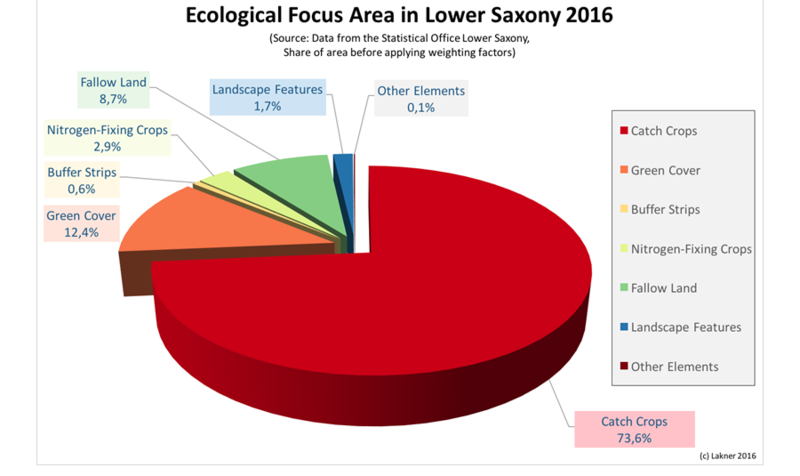 New data from Lower Saxony on the registration of ecological focus area (EFA) for 2016 are published and the data shows EFA is still an expensive measure for taxpayers with little positive impact on biodiversity. Sebastian Lanker gives ARC2020 this exclusive on the topic. The first results of the implementation of the Ecological Focus Area (EFA) in 2015 were disappointing from an ecological point of view. As always with new measures, there are settling in difficulties, regarding administration and information. The questions is, after appropriate information by the ministries and the extension services, have farmers implemented the more effective measures or not? Moreover, has the performance of EFAs been improved in the second year? Silke Dahl has again done an outstandingly good job in analysing the data and providing a complete and very detailed overview on all counties in Lower Saxony to the public. Her analysis is published in the monthly bulletin of the Statistical Office Lower Saxony of October 2016. This is especially noteworthy, because even the EU Commission has not yet published a complete overview on implementation data in all EU-member states. Taken agricultural land, Lower Saxony is the no.2 production state in agriculture in Germany (after Bavaria) with 2.6 Mio. ha of agricultural land. If we take the gross value added of the federal states, then Lower Saxony has the largest value of 3,352 bill. 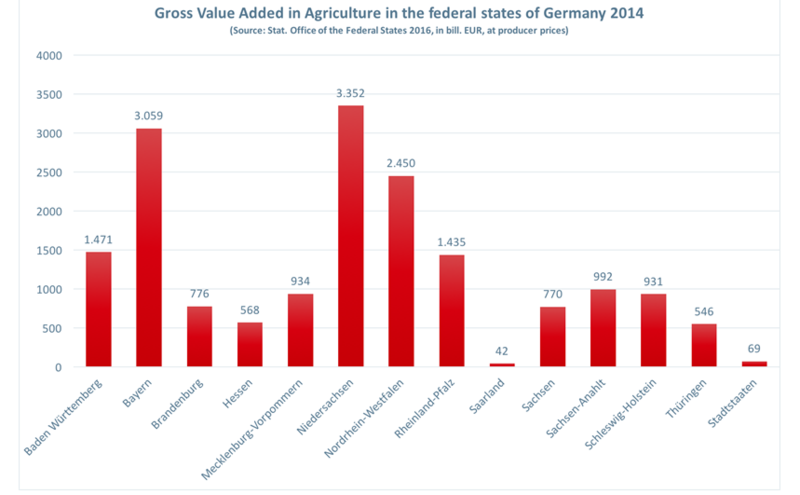 EUR in 2014 (see figure, data from the Statistical Office of the Bundesländer 2016) and contributes 21% of the total German gross value added in Agriculture. In the animal production, Lower Saxony has an even a higher share of 27.3% of the total gross value added and if we take the average profits (reported in the Agricultural Policy Report of the German Federal Government of 2015: p.103), Lower Saxony has the third highest profits on average. Lower Saxony has large areas with a high production potential around Hildesheim and Braunschweig, but also very competitive meat production in western Lower Saxony and some regions with highly specialized milk production in Northern coastal regions. And at the same time we can observe some environmental problems in Lower Saxony (as e.g. some Nitrate pollution especially in Western Lower Saxony) and also some regions with reduced biotopes and landscapes elements. From a biodiversity perspective, Lower Saxony is one of the states where actions to preserve biodiversity are highly necessary. This makes the implementation data of 2016 especially disappointing. In the following, we will refer to the net EFA-area before applying weighting factors. 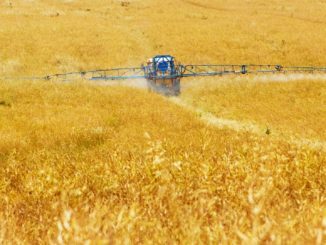 The data show that the EFA-area has been slightly reduced by 3.8% (= 12.100 ha). Since there has been a substantial “overbooking” of EFA in 2015, this adjustment is logical. Still, in Lower Saxony the share of EFA-area is at 15.9 %, which is significantly above the average share of Germany in 2015, which was 11.5%. North Rhine-Westphalia and Lower Saxony were the two federal states with the highest shares of EFA (both above 15%). This also means they had the highest share of the EFA-options with low weighting factors like nitrogen fixing crops (0.7) and catch-crops (0.3). So farmers need to register more area of these options to comply with the EFA-requirements. Catch-crops and green cover are the most important measures with together a share of 86%. The area has of catch crops has been reduced a bit (14.000 ha), half of that in just three counties, which indicates that some of the overbooking was a regional phenomenon. The second important measure is fallow land with 8.7%. This options has been increasing somewhat (+26.400 ha). From a biodiversity perspective, this can be regarded as a small step in the right direction. Interestingly the increments could be observed in arable regions of Hildesheim, Hannover, Uelzen and Gifhorn, where the shares of fallow land was already high in 2015. It seems that this option is not chosen by farms with animal husbandry, since here land is especially scarce and farmers tend to use this land rather for productive options. We can see this in the diagram below, where the highest share for catch crops with 92.5% was achieved in the administrative region of Weser-Ems, where the specialised meat-producer are located. Note however, that this interpretation is specific to Lower Saxony and cannot be generalised to other regions. Landscape features (1.7%) and buffer strips (0.6%) are almost negligible. Here no changes could be observed, despite the fact that buffer strips are supported by the state agri-environmental program. But as mentioned previously, this additional support seems to almost not affect farmers choices. Other elements (forestry area and short rotation coppice) contribute with 0.1% to the EFA-uptake. Is it worth maintaining these options, since they are chosen by so few but produce administrative burdens. If we evaluate farmers choices we need to see whether the options can contribute to farm biodiversity. Our own assessment (at the moment under review) shows that agricultural ecologists see especially fallow land, buffer strips and landscape elements as effective measures with a positive impact on biodiversity, whereas catch crops, green cover and nitrogen fixing crops are almost ineffective with regards to biodiversity. Taken this as a basis, we can state that 11% of the EFA in Lower Saxony might positively influence the preservation of biodiversity. There is a small development in a positive direction, since this share was at 9.8% in 2015. However, needless to say, that this is too little given the financial efforts taken by the greening policy. The other elements might have some general positive influence on the environment here and there. However, the EFA is supposed to specifically address biodiversity (as the EU-commission states in its motivation of the EU-regulation, figure 44) and here we must state, that still almost 90% of the EFA in Lower Saxony will have no biodiversity effect. After the second year, the results are still disappointing and as it is in fact a second year, we cannot take the administrative problems and missing information as an excuse. 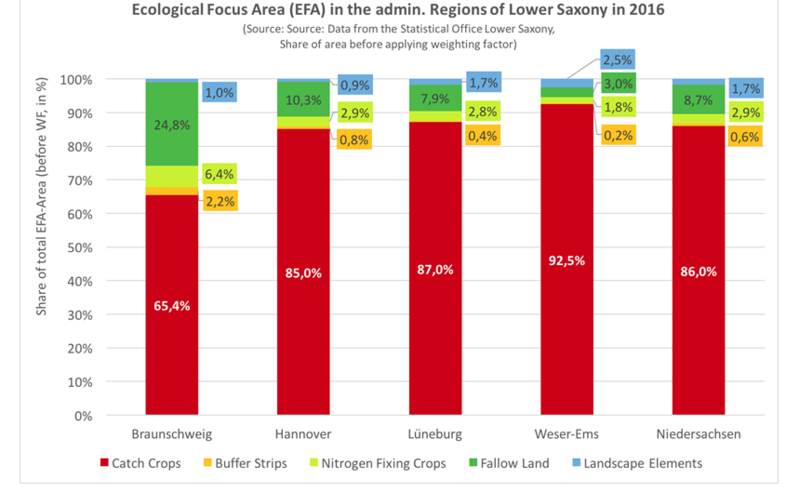 In Lower Saxony, a production region with high competitive advantages, farmers adjust their EFA according economic grounds resulting in a low effectiveness and just 11% of the area will help biodiversity. We have to take into account that Lower Saxony is a very productive region and the results cannot be extrapolated to the EU. Nevertheless, the example of Lower Saxony is interesting as biodiversity actions are required. In other regions EFA might function slightly or even significantly better (as data from Schleswig-Holstein of 2015 suggest). It will be interesting to get more data from other states and see whether adjustments are higher and it would be interesting to compare with other high productive regions within the EU. In this text, we did not analyse the protection of sensitive grassland and the diversification rules of greening. Interestingly, the EU-commission has recently published an Online Survey (See figure) of 3.304 EU citizens (with high participation of German farmers, citizens and NGO-members), which shows that just 51% of farmers expect a substantial or moderately positive impact of EFA on biodiversity. Even the citizens in this survey have quite a realistic picture on the potential impacts of greening. 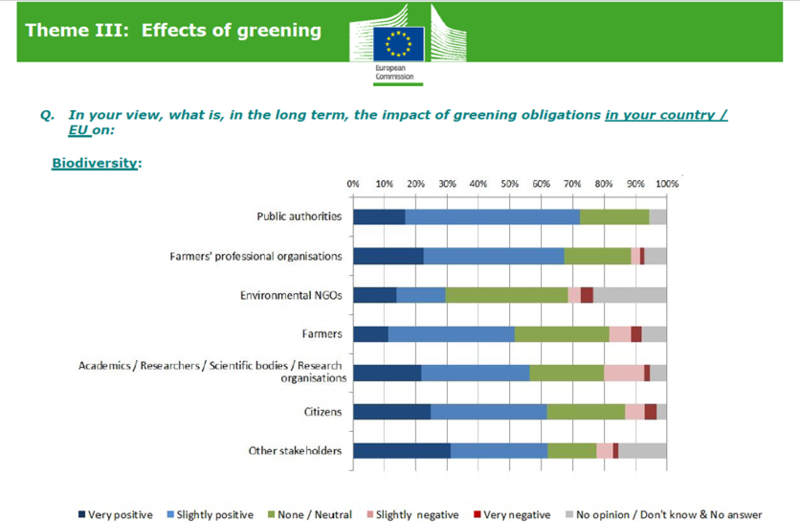 The EU-commission are still evaluating the first growing season of #Greening 2015. Some general data have been published in a very detailed document of the EU-Commission in June 2016 (EU Commission 2016 Review of greening after one year). However, this document does not contain specific figures on how many hectares of which EFA-option were registered in the member states. 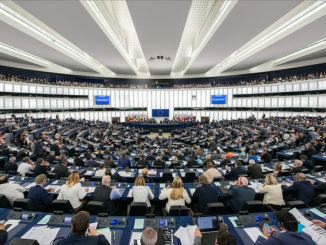 This goes back to problems of some member states reporting the greening figures to Brussels: Especially France, Italy and Scotland had problems and did not report all necessary data. However, the EU Commission so far does not even given an incomplete overview on EFA with precise figures of the states, where data are available. So the public and interested stakeholder is severely limited in participation in the greening debate before 2017. So the next months will be interesting, as some states will publish their data, so the debate will go on with or without official EU-data. And finally, Birdlife, Nabu Germany, Martin Häusling and Robert Habeck (Green Party) are, in my opinion, right in their conclusion that greening is an expensive failure and we need an intensive debate, whether or not to continue with direct payments of pillar 1 beyond 2020. There might be still some arguments, to use a general basic environmental scheme as entry level, however, even for this objective greening in its actual form is not appropriate. NABU Germany and Birdlife will present their vision and reform-model for a new “Fit and fair CAP beyond 2020” on November 16, 2016 in Brussels. We will closely follow this and other reform-proposals for the CAP post 2020 in order to improve the environmental performance and the development of agriculture towards more sustainability. 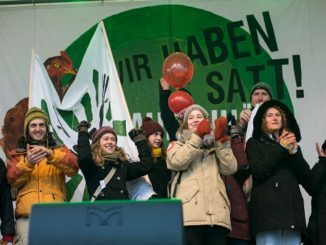 25,000 demonstrate in Berlin for a better agricultural policy!